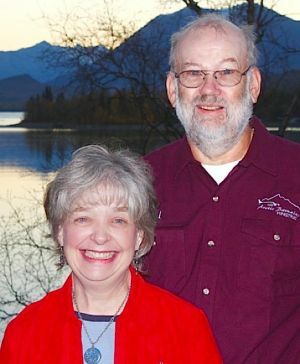 God led Al and Judy Nelson to Alaska in the fall of 2005 when Al accepted the position of Carpentry Instructor at Amundsen Educational Center, a small Christian vocational school in Soldotna specifically designed for Alaska Native young people. Two years later, Al and Judy were convinced that God was leading them to a greater ministry commitment in Alaska. They bought land and Al focused on building their home, while Judy began working at Alaska Christian College in Soldotna. Arctic Barnabas Ministries caught their attention during their first couple of years in Alaska. Al began to go on trips with ABM's Minute Men Teams for remodeling of village pastors' homes. Judy took part in a Bush Tea Party trip for the encouragement of pastors' wives. In the fall of 2010, Al and Judy joined ABM as Associate Staff. Al leads or accompanies some of the ABM Minute Men project teams. Judy enjoys cooking for Minute Men Teams. Al grew up in rural Minnesota. He learned carpentry from his father who farmed and worked as a local contractor. As well as maintaining his construction skills through the years, Al earned a Math Degree from St. Cloud State University (Minnesota) and taught Math for 32 years before retiring in 2001. In retirement he focused on construction, first supervising the volunteer build of a church in Wisconsin and then forming his own construction business in Red Wing, Minnesota. Judy grew up in rural South Dakota. She attended Luther College of the Bible and Liberal Arts in Teaneck, New Jersey, and then pursued an Elementary Education Degree at Augsburg College in Minneapolis, Minnesota. She taught for four years in Al's home town, where they met at his church and were married in the summer of 1973. She quit teaching when their first child was born in 1975, to focus on raising their children. She later taught English as a Second Language, then operated a childcare business in her home, and finally re-entered teaching as a substitute. She still subs for the Kenai Borough School District, but she also maintains awareness of village issues as she tutors and helps to bring hope and healing to Alaska Native college students at Alaska Christian College. Both Al and Judy committed their lives to Christ in their youth. Being raised in a home and church where Missions was a priority, Judy received a definite call to mission work as a teenager. Her interest in missions motivated her to help start and chair the Missions Committee at their church in Red Wing, Minnesota. Throughout their Red Wing years, both Al and Judy held many church leadership positions. Now, Judy enjoys working with children in the nursery and at AWANA at Soldotna Bible Chapel. Al and Judy are the parents of three children. Erica, husband Jesse, and daughters Annika and Alexis live in Apple Valley, Minnesota. Darin, wife Laura, and sons Jacob and Tyler live in a suburb of Des Moines, Iowa. Steve lives in Ann Arbor, Michigan.